Trump counsel Don McGahn reportedly knew since January 2017 that Rob Porter's ex-wives had damaging claims against the White House staff secretary. Chief of staff John Kelly, who defended Porter before his resignation, assured White House staff that domestic violence is taken seriously. White House Staff Secretary Rob Porter watches as President Donald Trump speaks during a meeting with North Korean defectors in the Oval Office at the White House in Washington, DC on Friday, Feb. 02, 2018. Top White House counsel Don McGahn reportedly knew for more than a year that Rob Porter's ex-wives had damaging claims against President Donald Trump's staff secretary. The Washington Post reported that McGahn took no action to investigate their allegations because Porter said they weren't true. The Post said that after McGahn learned of the allegations in January 2017, he wanted Porter to remain at the White House because he saw him as a steadying presence. McGahn's opinion did not change in June after the FBI notified White House officials of what they had heard from Porter's former spouses, or in September "when he learned that the domestic violence claims were delaying Porter's security clearance," the Post reported. It said that in November, a woman Porter had dated then contacted McGahn about the claims by the ex-wives, but the attorney still took no action to remove Porter. McGahn did tell Porter's boss, chief of staff John Kelly, why Porter still did not have security clearance, and Kelly agreed Porter should stay on the job, the Post reported. A White House spokeswoman did not immediately respond to CNBC's request for comment. On Thursday, White House spokesman Raj Shah told reporters: "I think it's fair to say we all could have done better over the few hours or last few days in dealing with this situation." Meanwhile, one of Porter's ex-wives, Jennie Willoughby, in an interview with CNN said that if Porter had not already "been abusive" with Hope Hicks, Trump's communications director, "he will be." Porter recently has been dating Hicks. Porter, 40, resigned Wednesday because the claims by Willoughby and his first wife, Colbie Holderness, that he physically and verbally abused them during their marriages to him. Porter has denied the allegations, which were aired earlier this week in explosive stories from British tabloid the Daily Mail. Kelly has been widely criticized for whole-heartedly defending Porterin an initial Mail story ever since pictures of Holderness were published by the tabloid showing her bruised face, allegedly suffered at his hands. Kelly had called Porter a "man of true integrity and honor." Kelly, who reportedly had urged Porter to stay on as Trump's staff secretary even after the pictures of Holderness were published, sought to reassure White House staff with a statement Thursday night that said "domestic violence is abhorrent and has no place in our society." 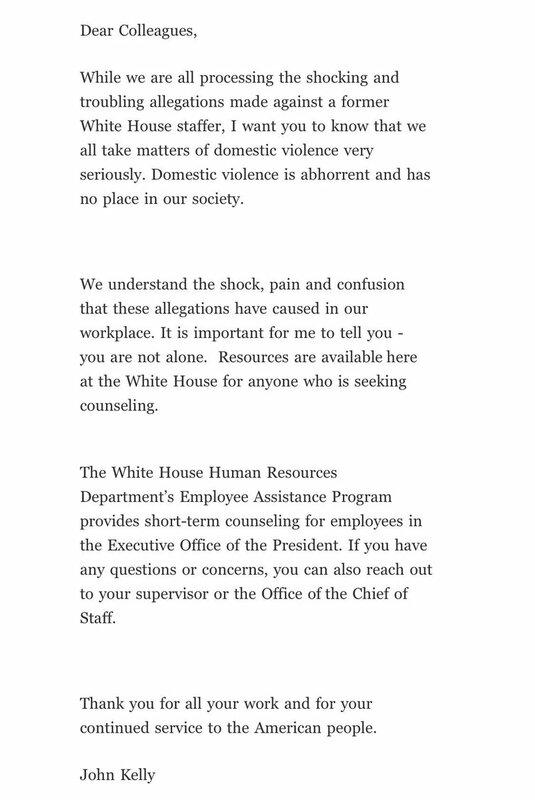 "While we are all processing the shocking and troubling allegations made against a former White House staffer, I want you to know that we all take matters of domestic violence very seriously," Kelly wrote in a memo sent to White House employees. The memo offered counseling resources. Some observers, however, wondered about Kelly's fitness for the job. Republican strategist Evan Siegfried, appearing on MSBC, asked: "Why is John Kelly chief of staff now, after repeated mistakes?" Siegfried ticked off a series of controversies sparked by Kelly's comments, which included calling some immigrants "too lazy" to register for protected status, making false claims about what a Democratic congresswoman had said at a ceremony, and asserting that the Civil War occurred because of "the lack of ability to compromise." "I have lost all confidence in him as chief of staff," Siegfried said. "He says things that are absolutely outrageous, and then does things in the case of Rob Porter that are morally despicable."